In the period 30.03-05.04.2019, a total of 71 cases of measles (laboratory confirmed or related to the epidemiological link) were reported. Out of the total number of newly reported cases, 35 cases are from Skopje, with 65.7% of them incomplete vaccinated, unvaccinated or with unknown vaccine status. from Kumanovo 10 cases were reported, of which 50% were unvaccinated, incomplete vaccinated. One of them is a seven month old child, 1 from 1-4 years, 3 from 5-14 years, 2 from 20-29 years. and 3 cases are over 30 years old. Struga – 11 cases, all over 20 years old. 6 were incomplete vaccine and 5 were vaccinated with two doses. Tetovo – 7 cases, two children under one year – unvaccinated, 1 from 5-9 years. with unknown vaccine status and 4 cases are over 30 years vaccinated with a single dose. Kichevo – 4 cases were reported, all of the age group 0-4 years, unvaccinated or with unknown vaccine status. One new case was reported – from Veles, Gostivar and Kriva Palanka. The case from Veles is over 40 years and has been vaccinated with two doses. The case from Gostivar is in the age group 20-29, it is incomplete vaccinated, and from Kriva Palanka is 9 months old, unvaccinated. In total, since the onset of the epidemic in Skopje in December 2018 as of 05.04.2019, 835 measles cases were registered in the Republic of North Macedonia, of which 619 were epidemiologically related and reported in the epidemic in Skopje. According to the place of permanent living, measles cases were registered in 19 towns in N.Macedonia, of which 556 were from Skopje, 63 from Tetovo, 71 from Kumanovo, 70 from Tetovo, 38 from Struga, 18 cases in Gevgelija, 17 Debar, 15 from Gostivar, and Kicevo, 13 from Veles, 11 from Kicevo, 4 from Kocani and Shtip, and in sporadic cases in the other 8 cities. The highest incidence of 100,000 inhabitants is registered in Struga (97.3 / 100.00), Skopje (90.0 / 100.000), Debar (61.3 / 100.000), Struga (56/100.00) and Gevgelija (52.3 / 100,000). During this week, the epidemic of measles are currently active in six health regions (Skopje, Tetovo, Kumanovo, Gevgelija, Kicevo and Struga). The largest number of cases are from the age group over 30 years, 344 or 41.2% of the total. High percentage of patients is also registered in the age group of 0-4 years with 36.5% of the total number of cases (n = 306). Out of 154 children aged 1-4 years, 140 or 90.9% were unvaccinated or with unknown vaccine status, and from 458 patients in persons over 20 years of age, 67.2% (n = 308) were unvaccinated, incomplete vaccinated or with unknown vaccine status. Out of the total number of 835 registered cases of measles, the highest number and percentage – 381 or 45.6% are laboratory confirmed, 220 or 26.4% are epidemiologically linked, while 234 cases (28%) are measles with clinical features. 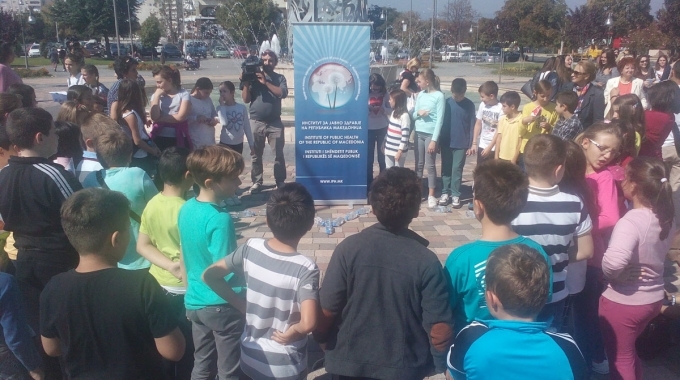 From the beginning of the epidemic, in Skopje, the total number of vaccinated people under 14 years of age who are subject to first or second vaccination is 11,919 children. In the rest of the republic, from the beginning of the epidemic, the total number of vaccinated people up to 14 years of age with a first or second dose is 7286 children. The total number of immunized people aged 14 years with MRI vaccine, since the beginning of the epidemic is 19205.